If you know something about Puerto Rico, you might have heard that there is a huge debt and that the students went on a strike on April 7, 2017 for more than two months with only three weeks left to finish classes. Who would think doing an internship without finishing the semester or knowing when classes were going to start again? Knowing that I was probably going to fail my classes, I still participated in an internship. If you are a student and fail a class, it is not just the class that matters but what comes after it. Such as losing scholarships, lowering your grade point average and possibly losing the opportunity to take classes at a university. You might be asking yourself if an internship is worth all this risk? I would say “yes”, it is worth the risk. 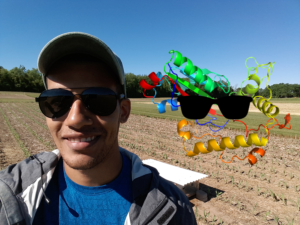 KBS REU Daimer Castro Vega takes a selfie with a cool representation of the enzyme called Nitrous Oxide Reductase. 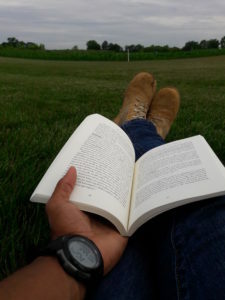 Before coming to this Research Experiences for Undergraduates (REU) internship at the Kellogg Biological Station (KBS) in Michigan, I was not very familiar with the whole issue of climate change, which is surprising once you start studying it. You don’t need a scientific background to notice that some things are changing in our environment. Longer dry periods, increasing temperatures and greater downpours are some changes that can be easily noticed in many places globally. You may have experienced these fluctuations simply by walking on a sunny day during the summer. These changes are affecting every form of life on earth. For instance, icebergs are melting and breaking free into the oceans. Have you seen how the grass turns brown and dry during the summer without enough rain? The same thing happens with crops when there is a long period without rain. Agriculture is affected by changes in rainfall patterns. Ironically, some of these changes are caused by our participation in agriculture. Notice that I didn’t mention just “farmers” as responsible for these changes. Even if you have not planted a single seed, as a consumer, you also play an important role when we talk about climate change. Rainfall manipulation shelters that were used in KBS REU Daimer Castro Vega’s summer research project. During my school years in Puerto Rico I learned that there are millions of tiny “animals” called microorganisms living in the soil. They are cool, but so little that you cannot see them with the naked eye. They use tools to break down their food; scientists call these tools “enzymes”. They are like the fork and knife you use to cut up your food. In soils these enzymes need a certain environment to work properly, and if they do not have the right environment to work, a gas called N2O (nitrous oxide) will be emitted to the atmosphere. Even though N2O is a non-toxic gas, when it is emitted, it enhances the effectiveness of the layer in our atmosphere that traps heat. Imagine that you are cooking something in a pot with a lid. Nitrous oxide works as the lid: in the atmosphere, it traps heat, which make our planet hot like the delicious meal that you were cooking in the pot. KBS REU Daimer Castro Vega gas sampling on the Great Lakes Bioenergy Research Center’s switchgrass plots. This summer I researched if changes in rainfall patterns affect the enzyme NOS, which is part of the denitrification process, in corn and switchgrass plots grown in the Great Lakes Bioenergy Research (GLBRC) experiment at KBS. My mentor and I tested the hypothesis that longer periods between rainfall events will slow NOS activation, resulting in greater N2O production. 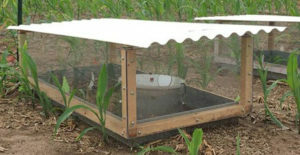 We used rainfall manipulation shelters to create soils exposed to the same amount of rain delivered at different intervals (2, 7, 14, and 28 days). We found that there was less enzyme activity with longer dry periods in corn plots, except for the 7-day rainfall interval. 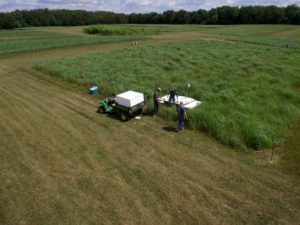 In switchgrass plots, the results did not show a relationship between increasing dry periods and enzyme activity. There is more data to analyze to see if these trends held over the entire growing season. Being around people passionate about their jobs really inspired me to keep learning more about topics that I am studying. Everyday doing research at KBS challenged me in various ways, particularly learning new things. Having the opportunity to meet people later in their careers gave me a better understanding of what I want to do with mine. KBS is definitely a place where young researchers go to grow. KBS REU Daimer Castro Vega reading the book “Who Really Feeds the World?” during a five minutes break before taking a gas sample in the field.